LIRI HOLDINGS LIMITED is a group of fintech company that specializes in worldwide remittance and settlement channels. Called “Money Platform,” the company challenges the financial industry by providing advanced financial infrastructures around the world. Money Platform has a slogan “Eliminate financial barriers with Money Platform” to aggressively expand its network. It aims to provide streamlined financial solutions for customers who don’t have access to global financial services. 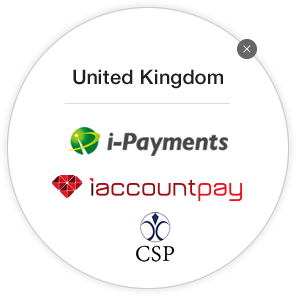 “Liri Partner Companies” is the result of our partnership with settlement and remittance technology specialists to further boost our efforts as a global fintech solution provider. 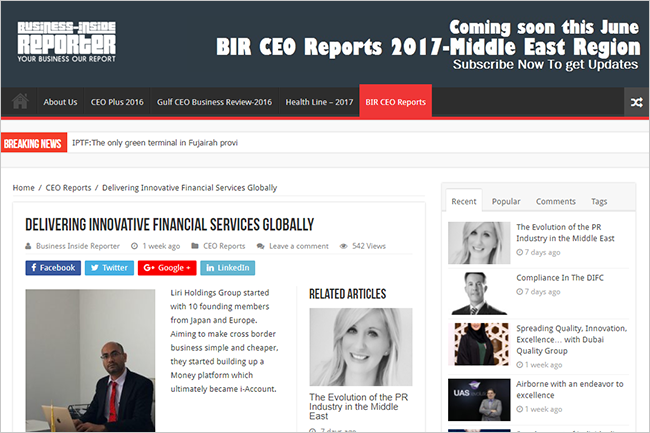 An established fintech company, Liri Holdings LTD. revealed in the recent issue of CIO Advisor Magazine that they consider integrating blockchain technology into their payments solutions. The company, known for providing cutting-edge fintech solutions, is once again among the Top 25 Companies that will be featured in the magazine’s June 11, 2018 issue. To meet the growing demand of providing convenient fund transactions, LIRI HOLDINGS LIMITED was happy to announce that they consider incorporating blockchain technology and plans to invest in cryptocurrencies; such technologies will further streamline fund transactions between businesses. LIRI HOLDINGS LIMITED keenly observed the shortcomings experienced by traditional banking systems in keeping consumers satisfied with their services. Many of today’s banks have to deal with impractically strict regulations compliance and inefficient systems. The company’s Vice President for Global Strategy, Samuel Appadoo, said that the company is constantly improving its strategies to satisfy more customers. 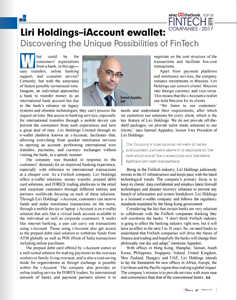 By hosting its own payment gateway, LIRI HOLDINGS LIMITED was able to offer e-wallet and remittance solutions to businesses, enabling them to have a secure and robust transaction processes. The company’s money platform is a front-end interface allowing businesses to efficiently access multi-currency and multi-channel collection and payment worldwide. Known for implementing the latest technologies, LIRI HOLDINGS LIMITED see itself expanding to continents like Africa, Europe, Asia-Pacific, and the U.S. 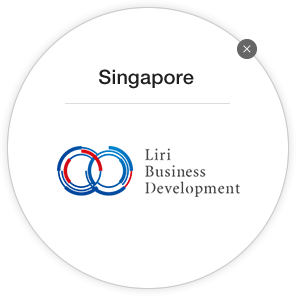 In 2017, LIRI HOLDINGS LIMITED was also among the top 25 FinTech companies in the Asia-Pacific region as recognized by the APAC CIOoutlook Magazine. The CIO Advisor June 2018 issue observed the ultra-fast “changing paradigm of technologies.” The magazine’s Managing Editor, Selena James clearly described how the world is overwhelmed by technology advancements. One of the notable advancements cited by James is when the tech giant Google introduced its breakthrough, Google Assistant, which allows an artificial intelligence to speak to a human over the phone. Our mission is to enable CIO's of medium to large enterprises based in APAC countries to leverage technology for their businesses. Ground-breaking innovations in technology solutions are redefining the dynamics of business paradigm. Moreover, roles of CIO's are changing. CIO's not only need to get most from their IT department spend or need to know how to build technology solutions that scales with their business, they also need to understand that technology will drive profits and values created by businesses CIOs look beyond the horizon to learn from peers in different industries and countries. We aim to be the next generation Advisor to the CIOs and their teams in their new expanded roles. We curate unbiased content and industry opinions . We also offer a medium for seasoned CIOs and senior IT management executives in APAC region to share their practical knowledge, experiences and wisdom with their peers in APAC region to collectively uplift the ROI's that enterprises get from their technology spend. 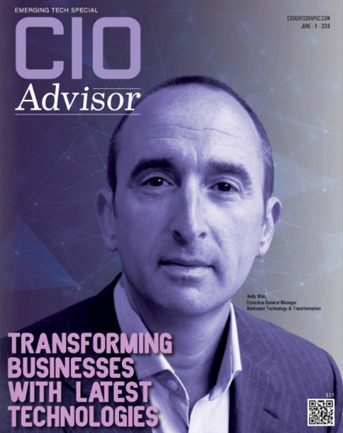 CIO Advisor is published from hub of technology, Silicon Valley, USA, with editorial presence in all major APAC countries. 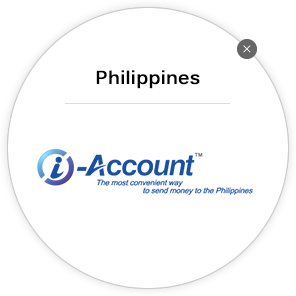 Our subscribers are based in all of APAC countries. 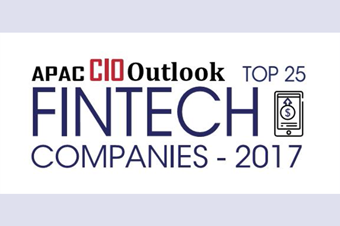 LIRI HOLDINGS LIMITED was included among the top 25 FinTech companies of 2017 in the Asia-Pacific region, according to the APAC CIOoutlook Magazine on their December 2017 issue, pages 15-17 . With the proliferation of new and re-established financial institutions focusing on digital technology, the Magazine aims to identify organizations that are working towards customer satisfaction, excellence in product development and innovation. “As the Fintech sector is innovating new products and services, it is essential to keep track of the emerging financial solutions providers. The list highlights some of the most significant firms who are efficient in assisting their customers towards a path of excellence,” says the Magazine feature article. 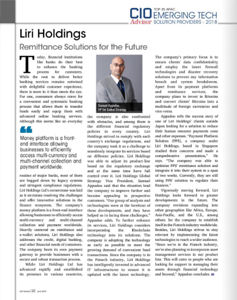 In the same magazine issue on page 47, LIRI HOLDINGS LIMITED was also featured in one of its pages, discussing the “unique possibilities of FinTech” that LIRI HOLDINGS LIMITED explores – including in-demand remittance transactions, virtual banking, prepaid cards, foreign exchange and even digital currencies trading such as Bitcoin – offered economically by utilizing its global network of banks and payment partners – ultimately providing bespoke financial services to individuals and corporate organizations. 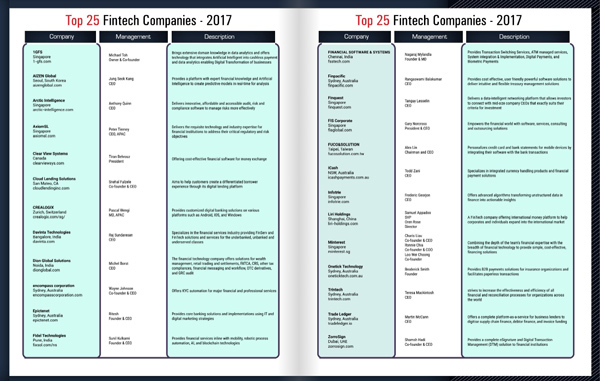 The APAC CIOoutlook Top 25 Fintech Companies of 2017 were listed alphabetically and in no particular order. 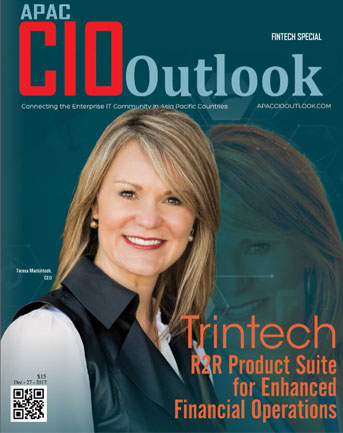 APAC CIOoutlook is a print magazine that aims to provide a platform for CIOs, CTOs and other senior level IT buyers and decision makers along with CXOs of solution providers to share their experiences, wisdom and advice with enterprise IT community of APAC countries. We promote our unique 'learn from our peers approach' in the Asia Pacific region. From enterprise applications to the leading trends in big data, mobile computing, security and the Cloud, APAC CIOoutlook delivers practical, actionable information from senior practitioners in the trenches. 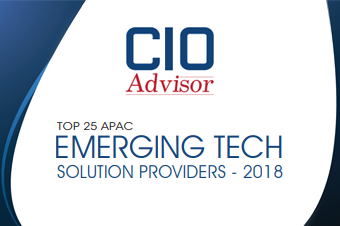 We leverage our extensive peer-to-peer network, among leading technology executives, to bring their experience and the best practices to other members of CIO community in Asia Pacific countries. We also identify and profile emerging companies providing cutting edge solutions to enterprises in APAC. For every technology and every industry vertical, our research team has access to and has deep background research done on hundreds of vendors providing solutions in APAC. Published from the hub of technology, Silicon Valley, USA with sales office in Hong Kong and editorial presence in all major APAC countries. APAC CIOoutlook is designed to connect the Enterprise IT community of APAC countries. For this selfsame reason, LIRI HOLDINGS LIMITED has always been innovating and extending its reach. 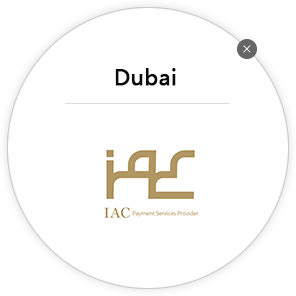 It is a financial technology company offering e-wallet solutions, money transfer services, prepaid debit cards, merchant account services, business consultancy, and offshore incorporation globally. It holds offices in Hong Kong, Shanghai, Taiwan, South Korea, Philippines, Singapore, Ireland, United Kingdom, New Zealand, and the UAE. Designs to put up new offices in Africa and the Pacific region to live up to the demands of their worldwide clientele are being undertaken. The company began with 10 founding members from Japan and Europe. Aspiring to build cross-border business simpler and less expensive, they embarked on building up a money platform brand which is Account. “After careful listening to our clients’ demands and total understanding of their requisites, we tailor-made a resolution for each client. It has been a Liri Holding’s recipe for success,” says Appadoo. The company’s mission is to extend services with more convenience and a lot cheaper than that of a traditional bank. LIRI HOLDINGS LIMITED has three main pillars: a money platform which is a secured e-wallet/remittance solution known as Account where individual or corporate clients can receive funds and make remittance transactions within a secured web-based solution or through a mobile app; a prepaid debit card called i-Card in which funds or payment of salaries can be transferred instantly from the client’s wallet to the card and can be used to withdraw from ATMs worldwide, point-of-sale and online payments; and a payment gateway to allow clients to process credit card transactions for their online stores – the i--Payments based in the UK and IAC Payment Services Provider which is based in Dubai, UAE. They too furnish a white label solution which incorporates all the above. Carrying such a commercial initiative is a worthwhile challenge because it comprises of so many facets of engineering, management, finance, and compliance altogether. That’s why LIRI HOLDINGS LIMITED invests wisely in their IT infrastructure. Ensuring the systems are up-to-date is critical, since they deal with client data with extreme confidentiality. The company leaves no stone unturned to have their security system in tip-top shape -- depending on their standard encryption SSL technology and a cutting-edge firewall system to prevent unauthorized access. Ensuring as well that client information is safeguarded from data theft, prevention of unauthorized access through an international standard server. Maintaining anti-phishing strategy based on VeriSign EV SSL, and compliance on Strict User Authentication Procedures. 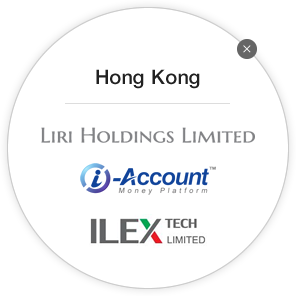 Since all their services are duly licensed, there is also the fact that they are liable not only to their clients, but also to their regulators in Hong Kong, UAE, Philippines, UK, New Zealand, Singapore, among others -- the reason why LIRI HOLDINGS LIMITED is exceedingly cautious in their choice of IT infrastructure and software for their IT park. While the customer base for LIRI HOLDINGS LIMITED mainly consists of banks, corporate organizations and payment service providers, they focus more on B2B and proudly put themselves as a money infrastructure for corporate and financial establishments, which is their competitive edge. In general, it is understood that inter-bank transfer is established on a SWIFT transaction, but apart from this, there are many other money transfer methods existing independently. It is necessary to incorporate all these methods together for the customer’s convenience and welfare. Additionally, small companies and a heap of people are not satisfied with existing bank services. There is a timely need to provide an alternative banking and financial solution to such clients. “At LIRI HOLDINGS LIMITED, we trust that open innovation and collaboration will enable and empower FinTech startups and corporations to not only address changing customer needs, but to do so at a faster rate with a more meaningful impact,” Appadoo stressed. 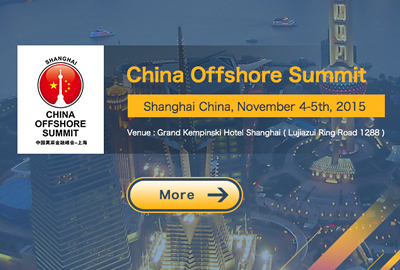 Shanghai will play host for the China Offshore Financial Summit to be held on November 4-5th, 2015, which is such a great honor for LIRI HOLDINGS LIMITED to be invited and be part. Onshore and offshore financial, compliance experts as well as government officials will flock to the center of Lujiazui Financial Center in Pudong to share their valuable insights and experience. Day Two of the summit will have Chinese advanced financial intermediaries, professional associations, international trust companies, bankers, lawyers and company service providers to comprehensively discuss investment, trading and wealth management and so on. LIRI HOLDINGS LIMITED will introduce four of our services - Account Service, Prepaid Card Service, Online Merchant Service and Forex Broker Package, which all aim to provide the perfect financial solution to corporations who need them. Through this summit, we hope to meet more counterparts and clients, create more business opportunities, master more real time information and corporation needs, and to constantly develop and improve our products and service. Lead by Liri Holdings, a strong and reputable global money infrastructure called Money Platform is built, which integrates remittance channels all over the world. Through Money Platform, Liri Holdings seeks to fulfill its mission, that is, to break financial borders to benefit those unable to access global banking services and smooth the way for remittance, settlement, and e-wallet services. It also aims to removing barriers to international businesses to embrace more and more Investment enterprises. It is applicable for various trading modes like interlinked shops. We are integrated with various international brand cards provided in low cost and low commission charge. This technique can help interlinked shops to improve the sales volume. Settling with credit card is indispensable to on-line business. When the system has a bug, the payment via credit card will be terminated, and there will be a fatal problem if an improper decision is made, so it must be chosen cautiously. The Merchant service provided by our company is based on the credit card standard PCI DSS plan system by which a more complete and safer commercial account can be provided to promote the enterprise exchanging rate. By the on-line commercial service provided by our company, various commercial account demands can be satisfied in a more extensive and more reliable bank network. The risk is minimized by risk refunding and illegal settlement control, and the settlement can be performed safely by both the enterprise with the system and the enterprise's client. eWallet merchant service is a powerful payment platform for merchants’ businesses.eWallet merchant service aims to solve all the problems faced by cross-border merchants. We understand the hardships the merchants experienced when doing business abroad. They always have to deal with costly banking charges and complicated remittance processes when clients buy products or settle membership fees. Merchants also experience such problems when making commission payments as they have to shoulder its costly fees. Merchants can fully customize the system Merchants are given API access to personalize the system and functionality of their platform. eWallet merchant service API has a smooth Money In and Money Out for the convenience of business members. Highly suitable for the financial industry E-wallet branding, investments, cross-border trading websites, Bitcoin wallet business, ICO platform and cross-border MLM businesses are possible with eWallet merchant service. Time and cost be improved dramatically We offer very competitive prices in the industry. In addition, eWallet merchant service system is very convenient to use, freeing up more management time for merchants. 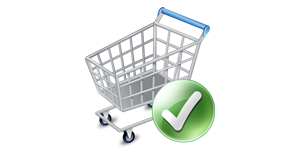 Setup time and cost efficient eWallet merchant service has the most competitive price in the industry today. Merchants with eWallet merchant service system can focus on managing their business because it frees them of many tasks that eWallet merchant service can automatically do. 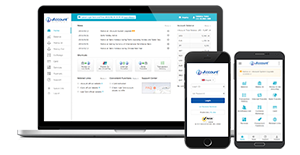 Account is a Money Platform service that money transfer, payment, exchange and E-Wallet can be realized at any place on PC, intelligent mobile phone and tablet PC via internet. By international brand cards, shopping in global shops and trading by cash can be realized via ATM. Additionally, it is also a kind of on-line Money Platform service applicable in over 200 countries of the world. Different from some other services only applicable in designated countries, it has all globally applicable function. Deposits in Account are supported by SwiftBank in 200 countries of the world, local banks in about 50 countries of the world, other types of E-Wallet, and cards or electronic coupons. Cash in Account can be transferred to other Account, local bank, SwiftBank or Card interlinked with Account, withdrawn via global ATM, or settled via POS, so it is very convenient. It is a multi-currency account by which 22 currencies can be managed without any exchanging risk. The Money Platform system of Account is available for the client in 4 languages (English, Chinese, Korean and Japanese). Our E-Wallet service is a collaboration between your brand and our system. Our service enables you to enhance your branding by giving you free rein on adapting the service name, logo, and design to match your corporate brand, while featuring the necessary features to run an E-wallet such as 24-hour money transfer in mutliple currencies and currency exchange. We have a track record of providing simple, quick, and secure online money transfer services as an E-Wallet operator over the years through Account. Why not put this experience and knowledge to use with your original brand E-Wallet? *E-Wallet refers to an electronic money account which handles, among other things, money transfers on the Internet. Any prepaid card can be safely used via interlinking with Our group's Ewallet account. 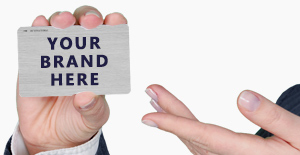 As a professional Prepaid Card company, we accept international brand cards. We also provide USD・EUR Prepaid card techniques in International brand card for our group's Ewallet account holders and enterprise clients. Applying for this card is involved with no strict examination procedures for a credit card. The fund can be charged into the card before using the card, in global ATM with brand mark and interlinked shops. As a System Service Provider, we mainly provide Meta Trader 4 for Forex traders in FX field, and cooperate with the third party to customize a new generation of platform via flexible distribution with Broker. We further cooperate with large banks in the world to provide competitive liquidity and price. A complete software pack service is provided for new Forex Broker so that the benefit can be maximized in the minimized cost in commercial operation and system maintenance. It contains Account monetary basic service and real-time transferring to Forex account, transferring among clients and cashing from card. Cryptocurrency exchange is a platform where customers can trade cryptocurrencies and fiat money.But more than being just a simple exchange, it also provides services such as margin trading, cryptocurrency settlement solutions, e-wallet, etc. The exchange platform enjoys the advantage of combining various types of financial services and provide customized financial solutions for our customers. eWallet merchant service is a powerful payment platform for merchants’ businesses. eWallet merchant service aims to solve all the problems faced by cross-border merchants. We understand the hardships the merchants experienced when doing business abroad. They always have to deal with costly banking charges and complicated remittance processes when clients buy products or settle membership fees. Merchants are given API access to personalize the system and functionality of their platform. eWallet merchant service API has a smooth Money In and Money Out for the convenience of business members. E-wallet branding, investments, cross-border trading websites, Bitcoin wallet business, ICO platform and cross-border MLM businesses are possible with eWallet merchant service. We offer very competitive prices in the industry. In addition, eWallet merchant service system is very convenient to use, freeing up more management time for merchants. eWallet merchant service has the most competitive price in the industry today. Merchants with eWallet merchant service system can focus on managing their business because it frees them of many tasks that eWallet merchant service can automatically do. Copyright LIRI HOLDINGS LIMITED. All Rights Reserved. LIRI HOLDINGS LIMITED claims that we manage and utilize our customers' personal information in an appropriate way, adhering to the concerned rules and regulations. We promise to make reasonable efforts to safeguard the confidentiality of all personal information that we process relating to you and regularly review and enhance our technical, physical and managerial procedures to accelerate our informatization process. 7. Keep the policies and procedures under regular review and assesses that the risk mitigation procedures and controls are working effectively; iAccount Services will NOT do business with anyone suspected of or directly involved in Money Laundering or where funds have been sourced by any illegal activity.